Okay, what is up with Spain and Portugal? Are they not friends? Do they not share a peninsula? Is there no Iberian brotherly love? First I find out there are no regular, high-speed train connections between their capitals, Madrid and Lisbon, just an 11 hour overnight train. In fact, there are only four rail lines that cross the border between the two countries at all. Next, we try to rent a car for pick-up in Granada, Spain, and return in Lisbon. We are perfectly well aware that there is often a substantial fee to pick-up/drop-off in two different countries, but Auto Europe denied our request completely, saying there is no - nada - cooperation between Spain and Portugal with rental car exchanges. Guess what we'll have to do now? Drive to Seville, drop off the car, get on a bus across the border, and then rent another car in the first town in Portugal. How silly. 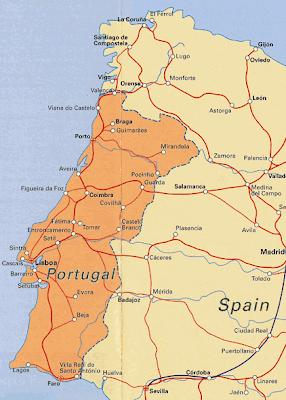 Only 4 rail lines (in red) cross the border between Spain and Portugal. UPDATE POSTED ON JUNE 7, 2012: Thanks to a suggestion by Denise, a commenter on this post, I tried working with Avis directly over the phone and got a much better deal! They wouldn't allow such a booking on-line, but through an agent we got a reservation to pick up a car in Granada and drop it off in Lisbon! Sometimes it pays to try everything. Did you try Avis? We rented a car last year - picked up in Madrid and dropped off in Lisbon. If I remember correctly, I couldn't make the reservation online. I had to call the 800 number. I will definitely check that out - thanks for the advice! Hey Denise! It worked! We canceled our two bookings with AutoEurope and booked with Avis after I called their 800 number! Thank you! I have no doubt that despite all of the craziness, you will have a wonderful vacation. Just keep saying "Enjoy the journey. Enjoy the journey...."
Can you commonly drop off a car in another country in Europe? That would seem like a strange concept to me, but it would definitely be handy if that's the norm. Good luck to you getting it figured out!